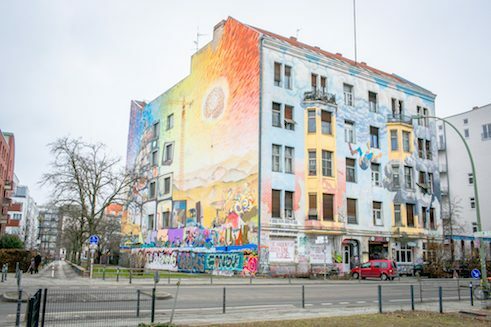 Since the arrival of the American graffiti movement in Germany in the mid-1980s, Berlin has been one of the most diverse street art metropolises in the world. In the western part of the city, divided from the eastern part until 1989, there prevailed a favourable attitude towards the new youth culture. 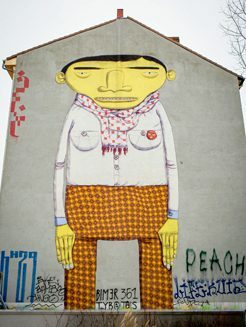 For one thing, graffiti tied in with a tradition of leftist protest movements that used house walls as the bearers of political messages and had long been present in the cityscape; for another, at the disposal of the newly emerging street art stood one of the most suitable carrier media imaginable – the Berlin Wall. It was completely covered with graffiti already in the 1980s. 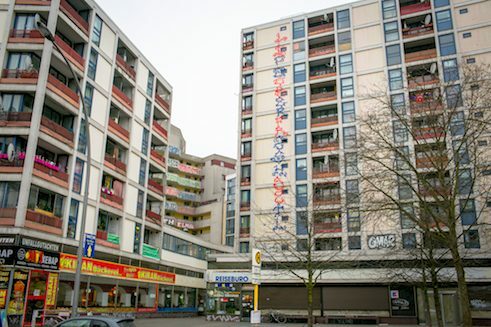 Following German reunification, the city became even more interesting for the scene because of the high vacancy rate and unclarified ownership of many houses. 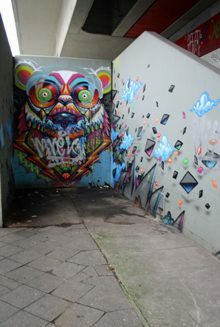 The post-Wall period offered numerous legal, or at least tolerated, spraying surfaces, so-called “Halls of Fame”. 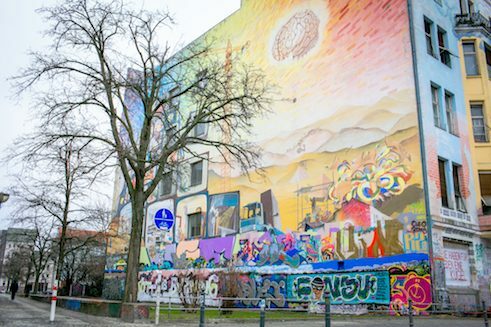 The amount, variety and quality of the graffiti made Berlin a popular destination for international graffiti artists. In the meantime, the art form has been refined in a variety of ways. It reception too has been subject to constant change. 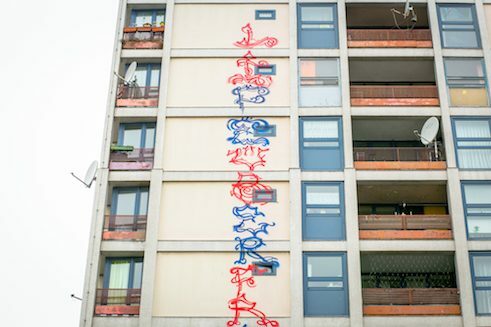 The purely typographic form of classical graffiti is still a matter of controversy, while unlike the sprayed name tags (“tags”) and resultant lettering images (“pieces”), so-called “street artworks” are held in high esteem by a broad public to whom they are expressly addressed. To the latter belong above all the sometimes elaborately composed wall pictures, so-called “murals”, which are increasingly being created as legally commissioned images. 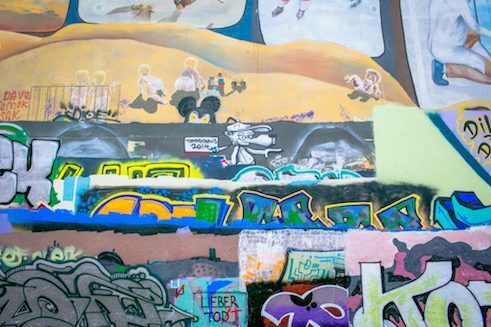 But a scene that operates illegally is also still active, and is committed to the original idea of graffiti as an urban political statement directed against the growing privatization and commercialization of public space. 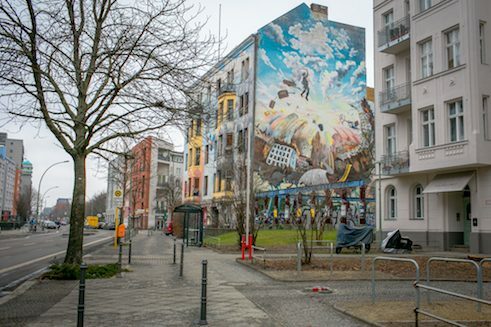 In cooperation with the Graffiti Archive / Archive of Youth Culture e.V., Goethe.de has compiled ten interesting examples of Berlin street art, which in effect tell a story about both the art and the city. 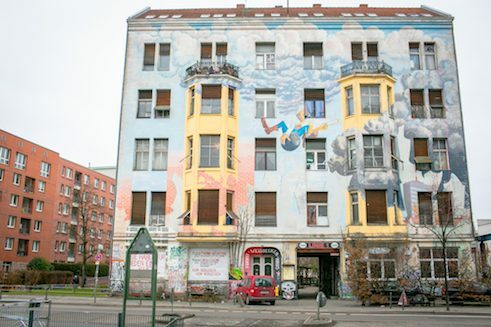 On a house façade in the Berlin district of Kreuzberg, several graffiti collectives created in the summer of 2014 a wall painting that depicts the current conflicts over gentrification in this part of the city. 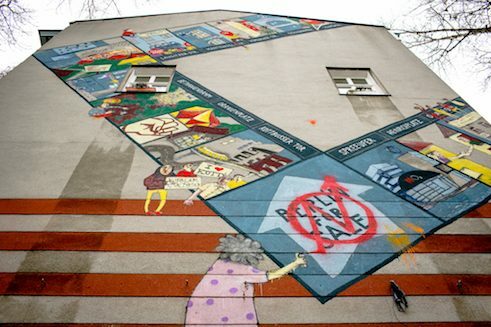 The picture recalls a Monopoly game and visualizes various strategies of resistance against privatization and expulsion: rent protests, noise demonstrations, squatting, blockading of evictions and other means of appropriatg urban space. The clear political message and its graphic realization link up with a tradition of public intervention that has very little to do with the coded language of American graffiti typography. 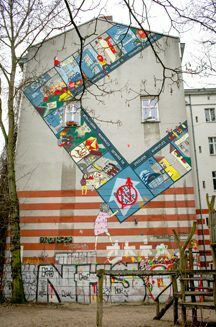 This leftist political façade art, with its slogans sprayed on house walls, was especially popular during the student movement at the end of the 1960s. 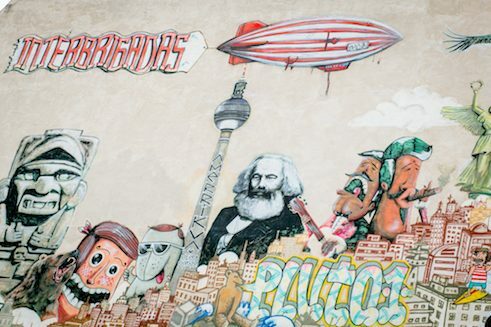 Another reference is to the Latin American tradition of so-called “Muralismo”, in which the history of leftist protest is recorded and passed on in large-format murals. 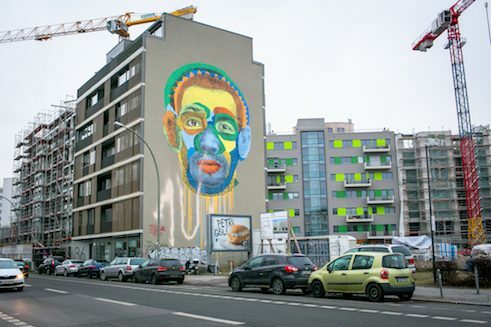 The best-known graffiti in the so-called “Curvy wasteland” are the two large-scale façade pictures (“murals”) by the Italian street artist BLU at the edge of a long-unused building plot. 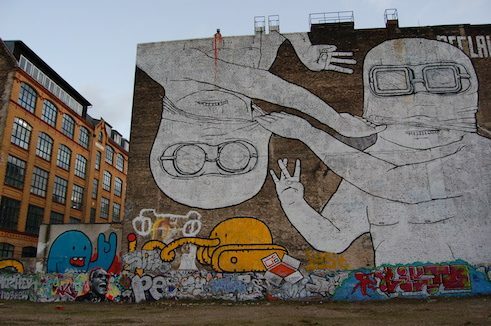 In 2007 BLU created two white figures who are trying to look under each other’s mask; in 2008 he added a headless figure wearing chained-together watches on its wrists. 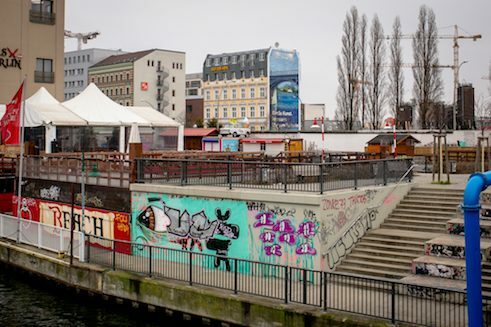 Both recall the incipient commercialization and difficulties of the coalescing Berlin of the post-Wall period. The area of approximately 12,000 square metres was part of a controversial building project and the object of repeated urban political clashes. The premises were used in the meantime as temporary living space and then cleared in 2014 after a fire. 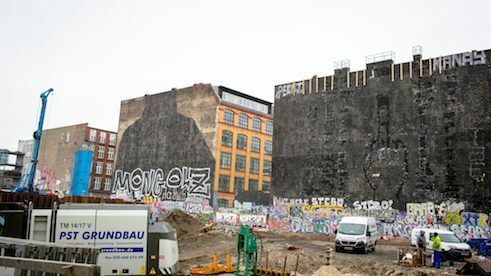 In protest against Berlin’s urban development policy, and fearing the co-opting of his art by the future owner of the property, BLU had the mural painted over in black in December 2014. In January 2017, construction work began for an office complex on the site. 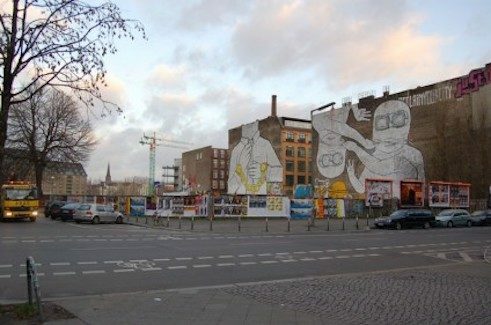 The large-format wall painting was created in 2007 as part of the graffiti festival Backjumps, one of the most important graffiti and street art exhibition projects in Berlin, which has given many international artists legal access to large wall surfaces. 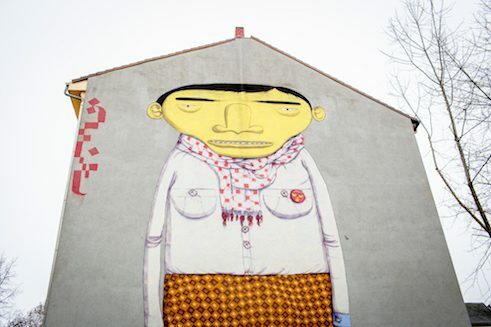 The Yellow Man is by the Brazilian street art duo Os Gêmeos. The identical twins are, along with artists such as Banksy, among the internationally best-known exponents of street art. 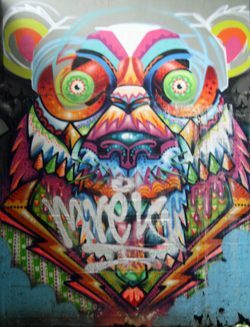 Large parts of the picture are painted with normal coating paint, as is common in Brazil because of the relatively high price of spray cans. 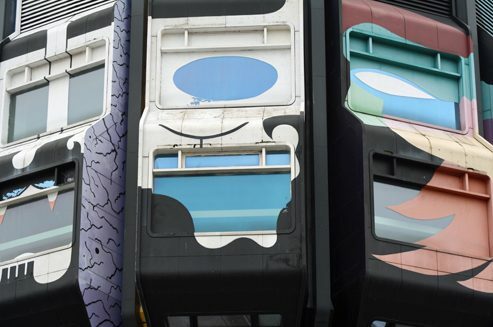 Os Gêmeos works with motifs referring to the indigenous Brazilian population and the rebellious roots of graffiti in the country; their hallmark is large, often masked figures. The works are now displayed at big art festivals and art galleries. 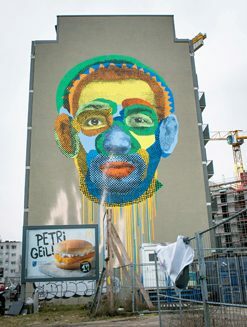 Although Os Gêmeos now also accept highly remunerative and prestigious commissions, they continue to see themselves committed to the tradition of social-critical street art. The forty metres-high, futuristic building, built in 1976, is one of the few preserved architectural concept-buildings from this period. 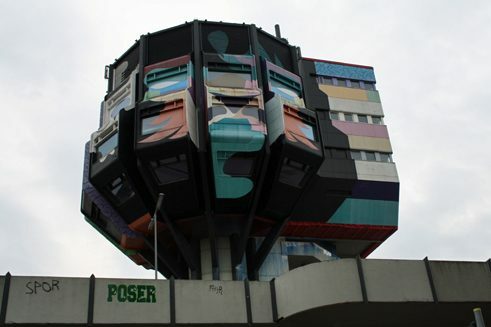 Its nickname, “Bierpinsel” (Beer Brush), already stuck in the year of its opening, 1976, owing to the building’s form and predominantly gastronomic use. 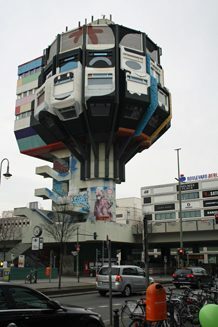 With the exception of small art actions and events, the Bierpinsel has been vacant since 2006. 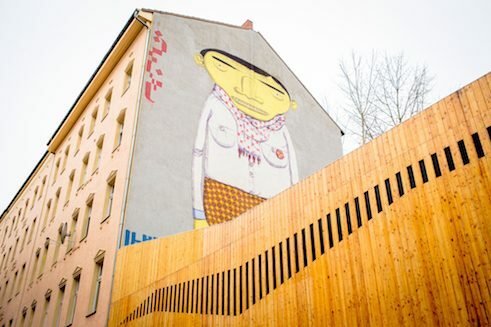 In 2011 it and the immediately adjacent Underground station Schlossstraße was made free at the initiative of an art project to international graffiti artists. Remarkable is that some of the sprayers were at the time known for their illegal work. 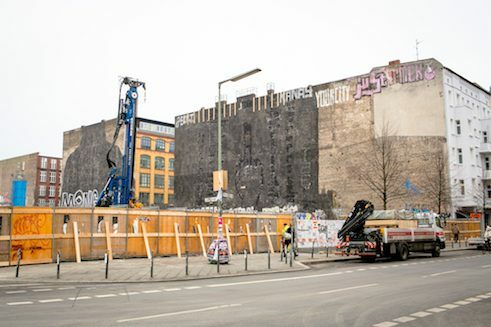 In the course of a general renovation of the building, it is planned to remove the graffiti. 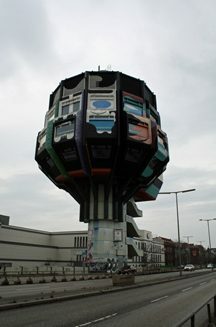 The Bierpinsel has been a listed building since 2017. The portrait, composed of patchwork faces, is part of the series Face Time, which the artist duo Various & Gould describe as a character study in the form of collaged, photofit-like heads. The aim is the creation of Dadaist patchwork identities, which undermine the common beau ideal and celebrate human diversity. 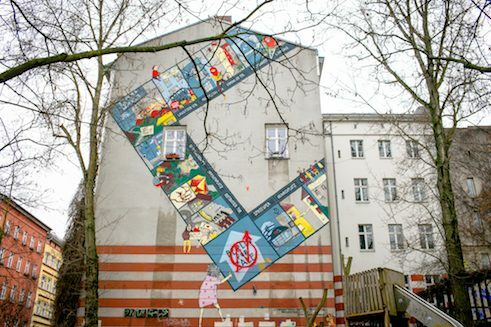 The 350 square metre mural was developed in consultation with the Berlin architectural office that is responsible for constructing a new housing estate in Berlin-Kreuzberg. 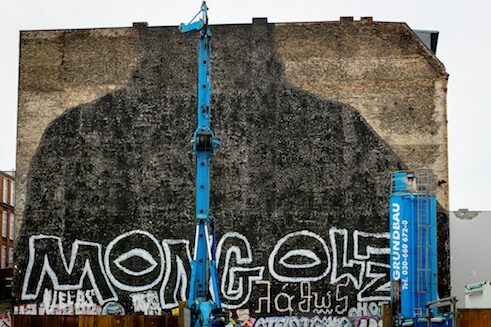 Such collaborations are generally not viewed uncritically in the graffiti scene, since they have little in common with its basic idea of re-appropriating urban space. 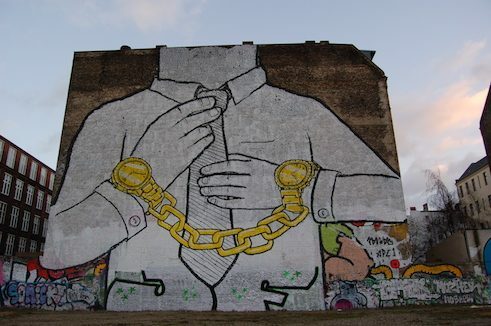 The artists, however, who have taken up socially relevant issues in their work, had a free hand in designing the picture, in contrast to graffiti artists who implement stipulated commissions by clients. 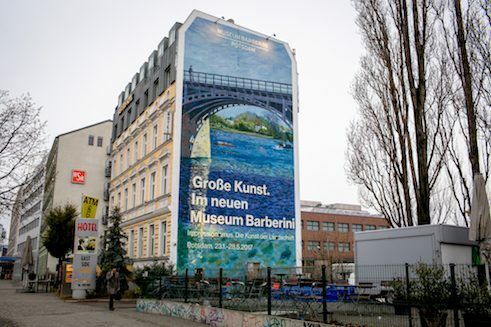 Unlike the Face-Time façade mural by Various & Gould, the wall paintings of the Berlin design studio XI-Design are well-remunerated advertising commissions. XI-Design, which is run by a tattoo artist and two former sprayers, specializes in realizing graffiti-style ads on house walls. 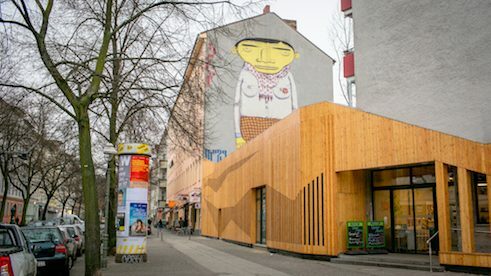 At the beginning of 2017, it had about 100 walls on offer nation-wide, eighty of them in Berlin. 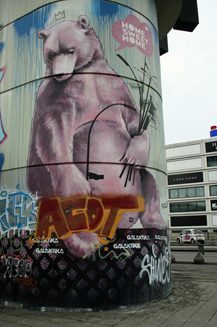 If a deal is struck, XI-Design then hires freelance graffiti artists to carry out the commission. The murals are of the highest craftsmanship and can as a rule, though not invariably, be recognized as advertising. In the scene, contract agencies such as XI-Design are controversial. The company is given credit, however, for using the revenues from advertising deals to fund projects that support the independent scene. 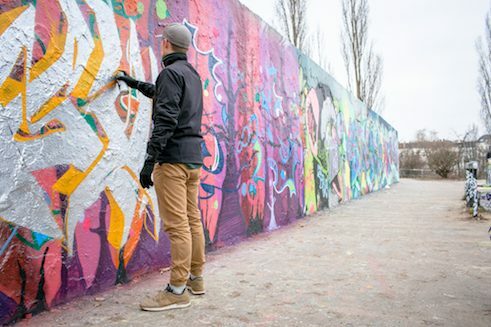 The Mauerpark (Berlin Wall Park) was originally a part of the so-called “death strip” along the Berlin Wall, which was transformed into a green area in 1994. The death strip was the area between the actual Wall on the west side and a smaller, so-called “hinterland wall” on the east side. 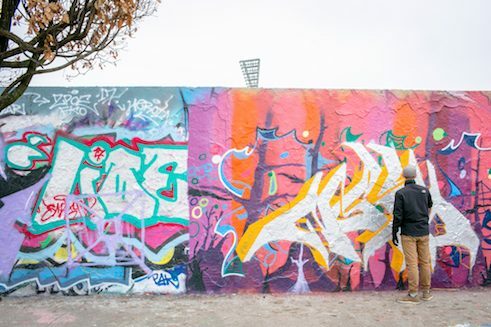 Part of this hinterland wall has been used by graffiti artists since the site was made publicly accessible in 1989. 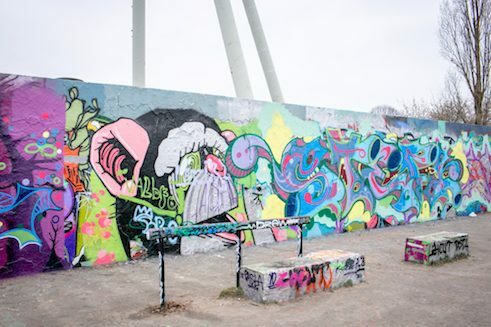 Though the Wall is now a protected monument, using it for graffiti has been tolerated without individual written permission since 2014. 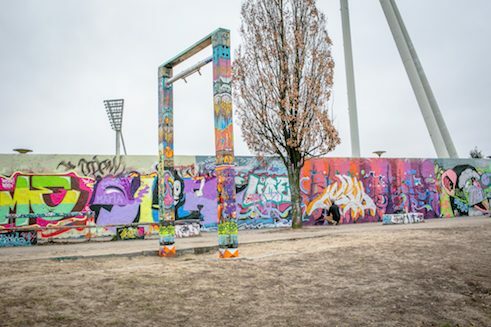 At present the Mauerpark is the largest and best known “Hall of Fame” (legal spraying surface) in Berlin and a popular venue for various graffiti events. 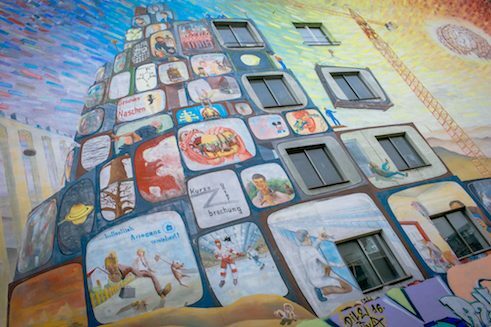 The mural on the outer wall of the hotel in the Berlin district of Kreuzberg is one of the largest wall paintings in the city. It was created at the initiative of the Berlin-based association Interbrigadas, which has been committed to inter-cultural exchange between Europe and Latin America since 2006. The picture shows the confluence of various cultural trends and stylistic directions. 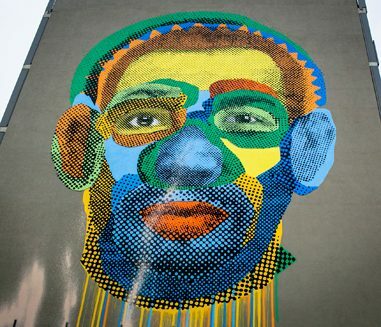 Prominently represented are the figurative depictions popular amongst Brazilian street artists. 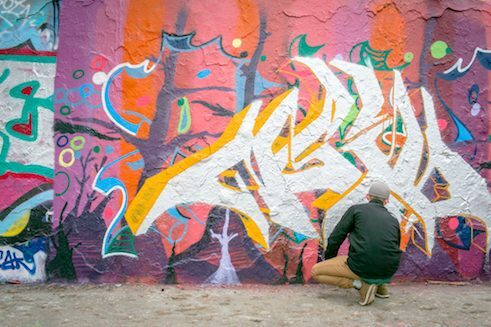 Another reference is a special graffiti typography, also developed in Brazil, which is reminiscent of runes – the so-called “Pichação”. 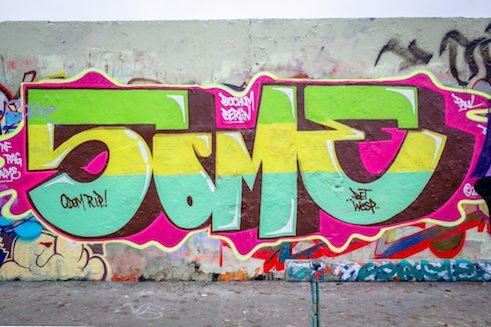 These tags, oriented to the typographic tradition, have a bad image in Brazil, but have found many adherents in Europe. In its early form, graffiti was often considered a sort of extreme sport. 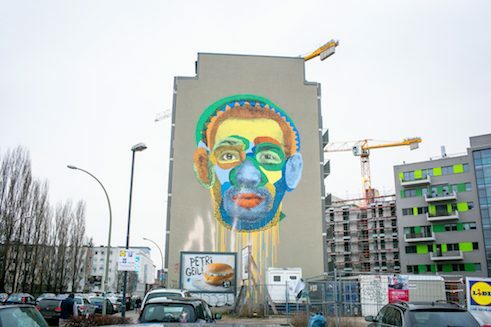 The Berlin-based graffiti crew Berlin Kidz, who since about 2010 have been causing a great stir in the scene with spectacular actions, link up with this tradition. A case in point is their abseiling down high-rise roofs and train surfing. 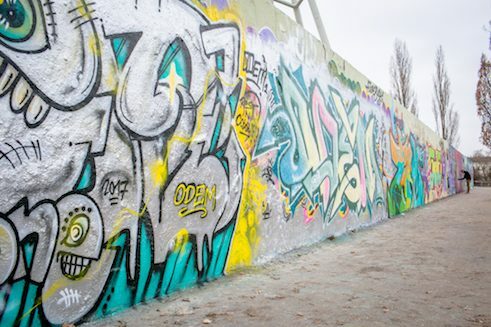 In addition to these highly dangerous actions, which require plenty of acrobatic skill and courage, the Berlin Kidz are lauded by the scene for their harking back to the political and rebellious elements of graffiti movement. 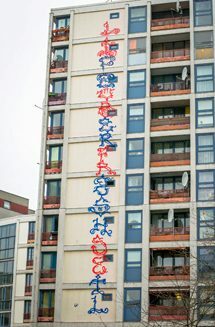 The graffiti art of the crew is also oriented to the American beginnings of sprayed writing, part of whose inspiration evidently is to create the most distinctive style possible: arabesque-like tags in hues of red and blue, which snake along house walls like tattoos and seem almost filigree in the cityscape. 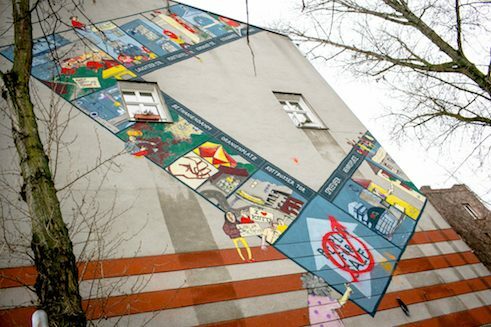 The wall paintings of the Tommy Weisbecker House in Berlin-Kreuzberg, recall the tradition of leftist protest slogans and symbols in West Berlin in the late 1960s. The peace symbol, today known worldwide, emerged back then as a European precursor of graffiti emblazoned on house walls. The history of the Tommy Weisbecker House also goes back to this time. In 1973 it was occupied by squatters and used as a self-managed housing collective, which also offered accommodation for the homeless. The name refers to the leftist radical Thomas (Tommy) Weisbecker, who was killed in a police action in the same year. The house was long considered a hotbed of leftist terrorist conspiracy. In the early 1980s it was finally recognized as a youth housing community. 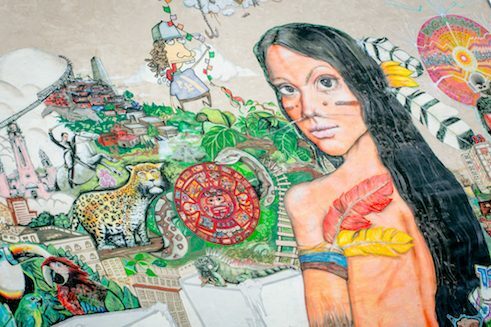 The motifs of the wall painting are based on central ideas of the leftist intellectual tradition: the dumbing down of people by the mass media and liberation through the return to nature. In addition to being the site of the impressive political mural, the left side of the house also serves today as a Hall of Fame. is a cultural and media scholar and works as a freelance author for “Süddeutsche Zeitung”, “Die Zeit” and “Die Welt”. is a coordinator at the Archive of Youth Cultures e.V. and heads with two colleagues its Graffiti Archive. 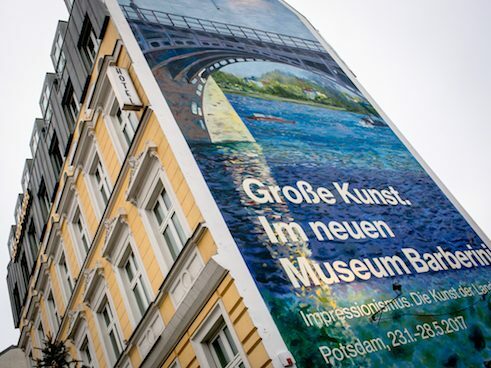 Copyright: Text: Goethe-Institut, Klaus Lüber, Martin Gegenheimer. This work is licensed under a Creative Commons Attribution – Share Alike 3.0 Germany license.